No Apologies - Ralph Marston - Something New Everyday! If you have hurt someone, then apologies are most certainly in order. 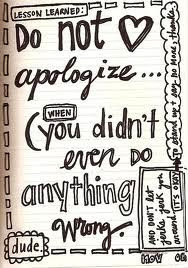 If you haven't, then you have no need to apologize to anyone. Be who you are, loving who you love, admiring what you admire, and valuing what you value. Instead of worrying about what other people might think, focus on what will bring you authentic fulfillment. Be kind and helpful and loving toward others, but don't be a slave to their opinions. Live with richness, with originality, and with no apologies. Make your own way through each day, taking responsibility for your actions and for your life. Be true to your highest, authentic values, doing what you know is right and good, creative and valuable. Your life is unique and precious, so give it the respect and commitment it deserves. Your possibilities are amazing, so use your full efforts to bring the best of them unashamedly to life. Live with true purpose and rock solid integrity. And you won't be wasting your time or energy on apologies.